As you know, spring can often be a very wet time in certain areas of the United States. Ponds, lakes, and streams are at their highest and the ground is often extremely wet and soggy. This often plays a big role in affecting the way that pests live as well. Not only are mosquito populations extremely high but other pests that normally live underground are forced out of their homes due to flooding. This leads to them seeking shelter elsewhere. Where Do Ants Seek Shelter? This is the time of year during which we get plenty of calls from homeowners in the area about increasing numbers of ants showing up on their property. Most of the time, these customers claim that the ants are in their kitchen and continue to come back time and time again no matter what they do to deter them. Ants, who typically will nest outside and travel to find food sources, often have their nests destroyed during this time of the year. So what is the next best thing for a colony of ants? You guessed it! Your home. Because your home is warm, dry, and gives ants access to food in a number of ways (crumbs on the counter, bags, and boxes of grains, the sugar left next to your coffee maker, etc.) Any and all food is enticing to ants and they will seek it out if your kitchen is not free of debris. It doesn’t take ants long to get settled into a new nest they have built. Whether it be under the floors of your home or within the walls, a colony can set up extremely quickly. Some of the worker ants will be busy shopping for groceries for the colony, while others are working endlessly to both expand their new colony and to increase their overall population. This is often the point at which those who are living in the home begin to notice that there seem to be ants in both their kitchen and bathroom. Sure, seeing an ant here or there isn’t really a big deal, but we guarantee that the frequency at which you begin seeing ants as well as how many you are seeing is going to increase. By this point, it is likely that all you can really do if you want to make sure that your ant problem doesn’t get worse is to call a professional pest control team in the Sacramento area. Sure, there are a number of different over-the-counter sprays, as well as traps you can put in your home if you want to get rid of ants. However, it is likely that this solution is only going to go so far and before you know it, you’re going to begin seeing ants crawling all over your home once again. If you really want to make sure you have solved the problem the first time, you’re going to have to hire the professional pest control company at Earthwise Pest Management. Our technicians will first inspect your property to see how big your ant problem is. They will then find the source of it and give you a clear idea of how they plan on getting rid of the ants once and for all. 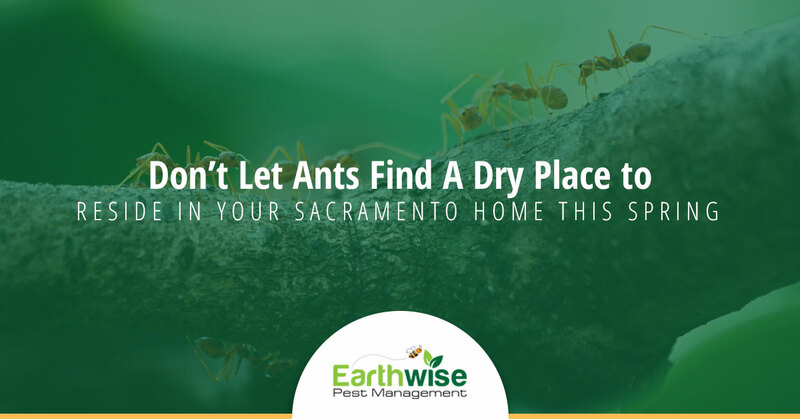 If you are interested in getting ants out of your Sacramento home, it’s time for you to call the experts at Earthwise Pest Management. We would be happy to solve your ant problem for you. Additionally, feel free to reach out to us if you are dealing with other pests in your home as well.